After having a quick chat with Ben Jackson, whom I do Food friday with on BBC Radio Leicester, we decided that our listeners wanted dishes that they could pretty much cook along “Real time” with whilst listening to the programme. It goes out at 4.40pm every friday which is a great time if you want a fairly early dinner. Thus, then allowing you more time at your local for a quick vino or Pint! A dish that sprung to my mind was a dish that I cook quite often for myself but I wanted a little twist on it. 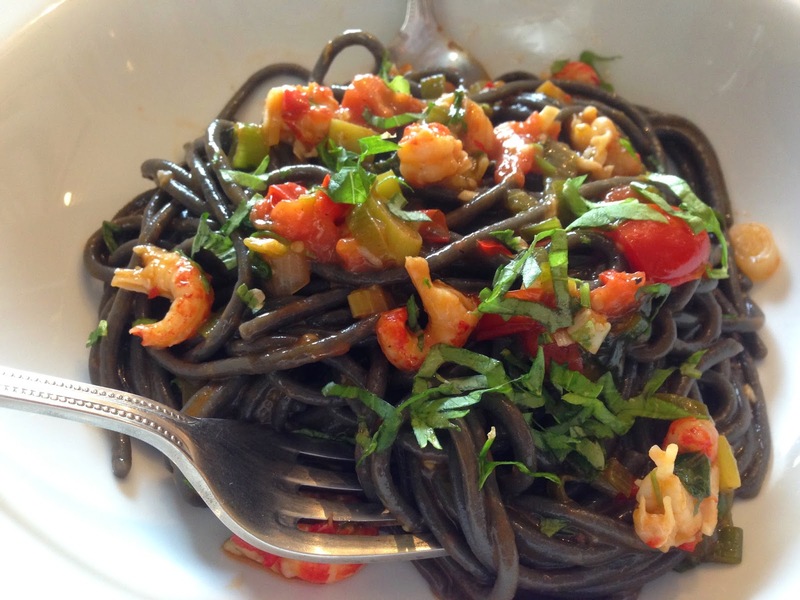 I would normally cook this dish with “Normal” Spaghetti or linguini and use Prawns instead of crayfish. 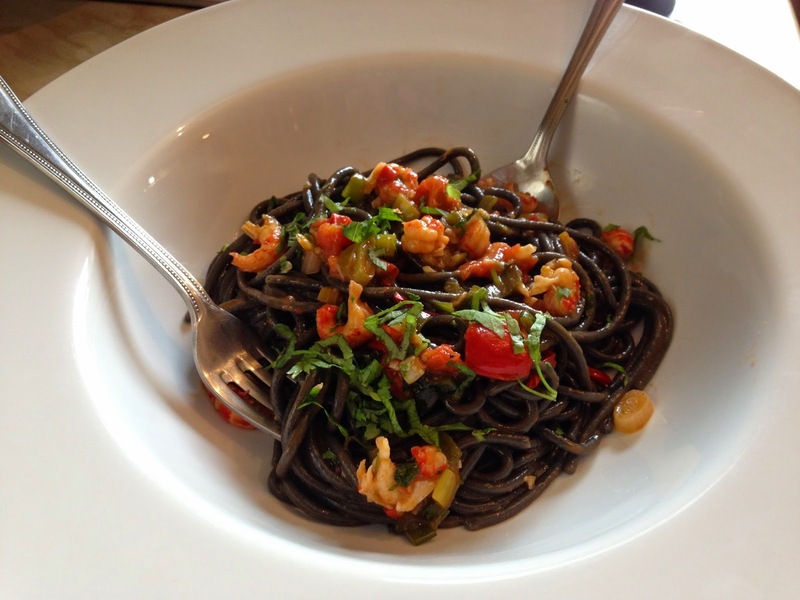 Now of course, you could use any other seafood, I just felt that this added real colour and extra flavour as the Squid ink Linguini does have a subtle flavour that I LOVE and I feel we sometimes forget about Crayfish tails also but they have so much flavour in them. I came up with a great Ravioli dish once which I used Crayfish tails so I will share this with you soon. 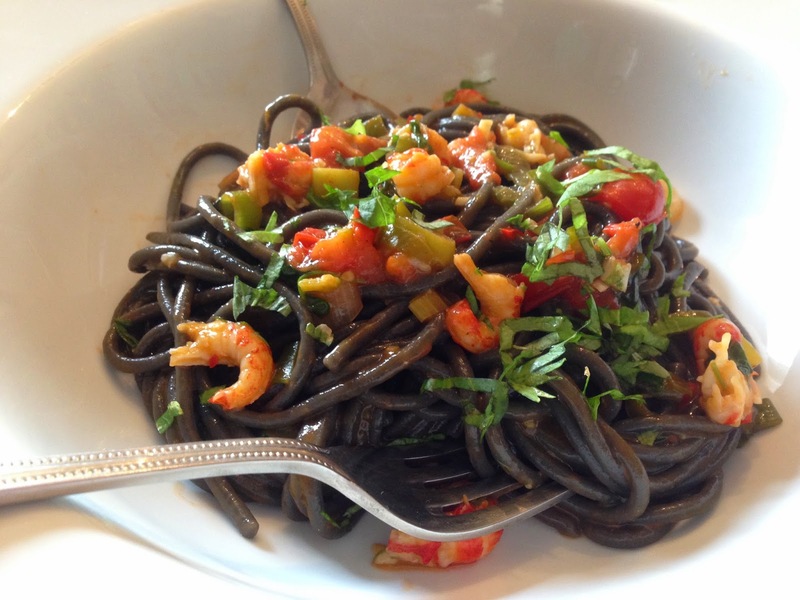 By the way, I have had some comments on that the linguini does look a little strange, but trust me…If you love pasta and combining Seafood…you are going to LOVE IT! Hear me and Ben Right Here! * Pop your Pasta into a boiling pan of Salted Water and cook for approximately 10-12 minutes or to packet instructions. * In a Frying/Saute Pan, Start to fry off the White ends of the Spring Onions and Chilli in Olive oil. * Add the Garlic and fry for another minute. * Pop in then the White Wine and start to simmer, reducing only slightly. * Add the tomato Puree, Tomatoes, Pinch of sugar and cracked Black Pepper. Cook for another minute or 2. * Add a little splash of water to the sauce. Taste…it may need a little more sugar to sweeten. * Put the rest of the Spring onions (Green parts) into the sauce. * Drain your Pasta keeping a little of the water and place the pasta into the sauce. Add the Crayfish and coat all the ingredients around the pasta. * Finally add your chopped herbs when the Crayfish are hot and Serve!